As a small neighborhood bar, we like to keep things relatively simple. As much as we love a whole bunch of different things, we do not offer Karaoke or trivia nights, pull tabs, televisions or darts. But if you ask the bartender, he or she could probably pull out a chessboard or dominoes. 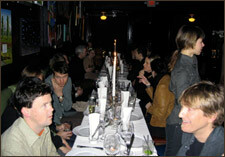 Nonetheless, every so often, The Hideout does host events and parties, both public and private. For notice of our special events, join our mailing list.